The Great Dane is a loving dog with a huge spirit and tends to be very brave. When around children, it is sweet and playful. It gets along with them very well. Because of its large size, it is recommended to supervise your children if they are playing with the pooch, but overall, you shouldn’t have a problem. It tends to play well with other family dogs or other family pets. It can be trained and is a bright breed. As a companion, it is great due to its loyalty and the urge to provide affection to its owners and family. The Great Dane is a large dog that needs daily exercise. It does not need the intense physical exertion as other breeds, but a long daily walk or game romp will do the trick. Despite its large, sturdy frame, the Great Dane would not live well outdoors. It really only excels if it lives indoors with the ability to be able to go outside when it pleases. It also is not suited to be an “apartment” dog due to its size and energy exertion requirements. Its great size requires room to live, which is why a family with a bigger house or fenced in yard would be the ideal living situation for the Great Dane. It also tends to be a “diva” when it sleeps, and prefers to sleep on very soft, cozy beds. The coat of the Great Dane is very short and requires minimal coat care. The biggest health concern of the Great Dane is the development of gastric torsion, cardiomyopathy, and/or osteosarcoma. All three of these conditions can become very serious, especially if they are not treated right away. If treated right away, then there is more of a chance to get the condition under control. This breed is also affected by minor concerns, less serious than the major concerns. Some minor concerns include CHD – “Chronic Hip Dysplasia”, CVI – “Wobblers' Disease”, ODC, HOD, and hypothyroidism. Cataracts, vWD, and entropion are also occasionally seen in the breed, but not very often. Like any breed, it is important to take your dog to the vet in order to get yearly checkups to maintain its health. Some of the suggested tests to run on your Great Dane include hip tests, eye tests, cardiac tests, and thyroid tests. If kept healthy, your Great Dane will live typically between 7 years of age to 10 years of age. 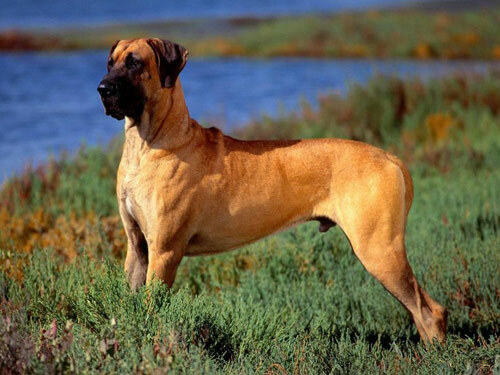 The Great Dane has been said to be a mix of the Molossus water dog and the Greyhound. It has a fearless hunting ability that is said to be derived from its ancestors. Back in the 14th century in Germany, this breed used its speed, strength, stamina, and courage to bring down big game, including wild boar. They began to become popular and became even more popular when society realized that the Great Dane is an elegant and graceful dog when not hunting. It came to America in the late 1800’s and Americans almost instant loved the breed.